Normalflora.net is all about Sprouts! 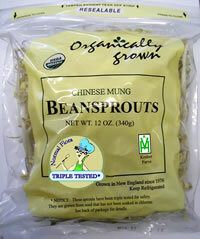 To ensure the quality and safety of these sprouts, we test a sample of every lot of seed we buy for quality. We further test every bag of seed for safety before we use the lot for sprouting. Finally, we test every batch of sprouts we grow to be sure they are safe. Because seeds could possibly have been contaminated with a human pathogen, the FDA recommends that seeds be soaked in a 20,000ppm chlorine solution before sprouting, and that children, the elderly and people who are immune-compromised not eat sprouts. Most seeds however, are not contaminated, especially if they are grown, harvested, and selected with care. Our testing program enables us to preserve the normal, healthy bacterial flora on these sprouts, and to maintain the organic integrity without compromising safety.